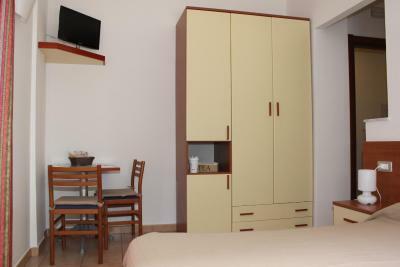 Lock in a great price for L'Arcobaleno Affittacamere – rated 9.2 by recent guests! Location Clean rooms / linens - though both room and toilets were small. Rooms were cleaned every day which is great. 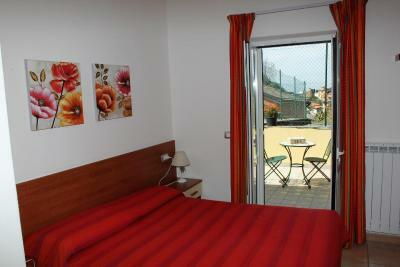 The rooms were well provided for - water, light snacks, Coffee maker etc Good rates. It was very quiet all night long, tucked up high and away from the more hustle and bustle of the center of the town. We liked the drying racks for laundry out on the terrace and I loved the windows and shutters on the doors and windows. Having air conditioning was nice as well. It was clean and well stocked with towels, there is a daily maid service and the staff was kind and helpful. Francesca is absolutely lovely!! She offered great suggestions and ideas on where to eat and places to visit. We also enjoyed having our morning cafe and treats provided in our room on our own private little terrace! 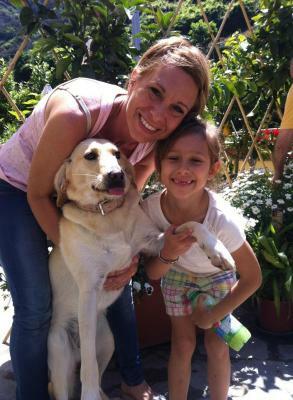 Francesca and her husband Andrea are so friendly and kind and their dog Lily is a sweetheart!! I hope we have to chance to go to Rio Maggiore again some day so we can visit our new friends!! Ciao!! Nice little place; limited amenities but clean. Nice little patio but no view. Like most places they don’t offer breakfast - no room- but they had snacks waiting on table in room and yogurt, water, juice in mini fridge. Really nice touch - refilled each day. Above and beyond. Place was very clean and had a private patio for room. AC worked fast and WiFi was good. 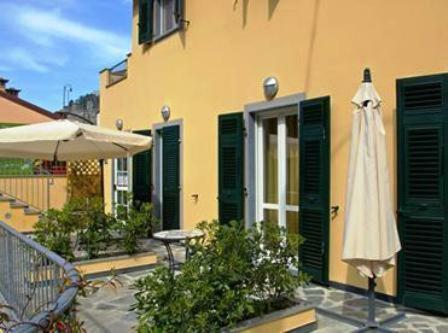 Owners really care about the comfort/enjoyment of your stay and helped with my itinerary of Cinque Terre the 4 days I stayed there. 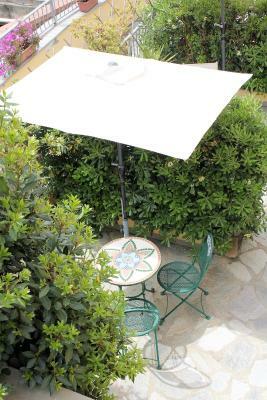 Friendly staff; check-in and check-out were fast and easy; good and prompt communication prior to arrival; The place is quiet and serene; The coffee machine at your disposal inside the room is very convenient; Cinque Terre tourist information point is around the corner, literally 10-15 steps from the hotel; the room had an air conditioner, which is a big plus; the room had a nice private balcony; also, there's a nice shared terrace; and parking area. 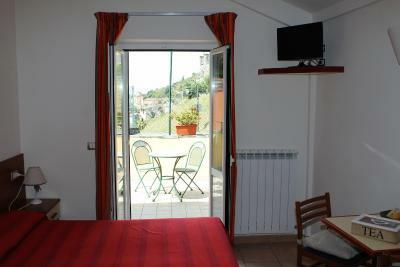 Overall, it is a great value for money and will definitely check its availability when visiting Riomaggiore next time. Also, we loved the owner's dog! Francesca (and family) were very accommodating and helpful! 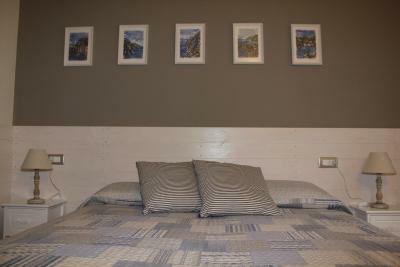 The room was very efficient and comfortable and a great place to relax after our long days of hiking Cinque Terre. It is also located at the top of the road (very steep walk but Francesca warns you to get a taxi if you have lots of luggage!!) near the entrance of the park so it is very convenient! No fresh breakfast but the coffee/latte/tea machine was wonderful and she leaves you juice, milk and lots of breakfast snacks. Overall great experience and we highly recommend it!! Francesca was the best hostess. Gave us recommendations, assisted with a travel mixup-was outstanding!! The guesthouse was very clean and eco friendly. Amazing room and location. Garage parking was included, which is very helpful in Riomaggiore. Our host was phenomenal! Very kind and helpful. 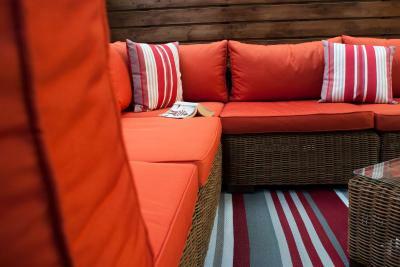 We loved sitting on the terrace in the evenings. It was very quiet and Francesca was a wonderful host. One of our top picks in Riomaggiore.Located 15 minutes on foot from Riomaggiore’s beaches, L'Arcobaleno Affittacamere is a 19th-century farm building renovated with eco-friendly materials. 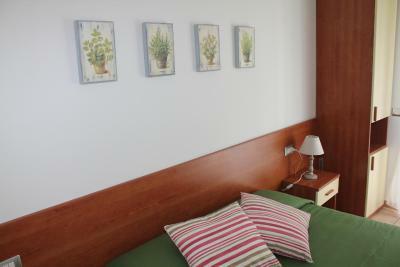 It offers free WiFi in the reception area, and simply decorated rooms. 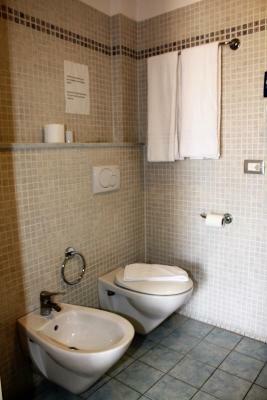 Rooms at the Arcobaleno come with air conditioning and a private bathroom. Guests will find some packaged breakfast items in their room. Riomaggiore Train Station is serviced by a public shuttle bus. 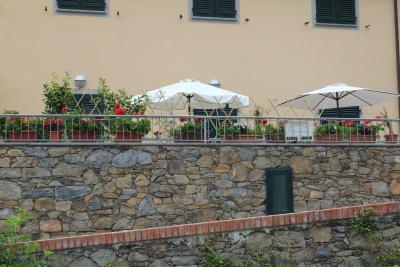 From here you have links to the other villages of the Cinque Terre, together with La Spezia and Genoa. 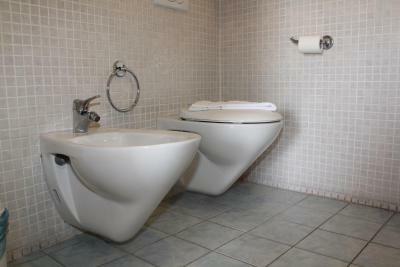 This property is also rated for the best value in Riomaggiore! Guests are getting more for their money when compared to other properties in this city. 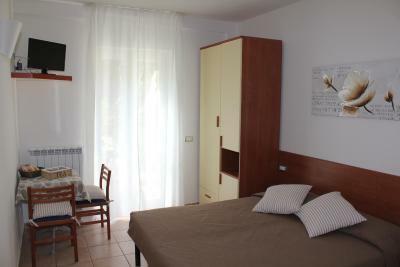 When would you like to stay at L'Arcobaleno Affittacamere? Offers a balcony with country views, and a private bathroom. Private parking is available on site (reservation is needed) and charges may apply. Set either on the ground or first floor, this room is fitted with air conditioning and has a mini-bar and free toiletries. Some rooms feature a private patio. L'Arcobaleno was open in 2006. It was an old farm so we have decided to fix it and make rooms for fguests from all over the world. Cinque Terre are a wonderful area and their wild beauty is Amazing. L'Arcobaleno is located in the upper part of the village of Riomaggiore, in a very quiet area near the river and the country side. Unfortunately we don't have a room for breakfast but in each room there is a coffee machine (coffee, tea,cappuccino) and we offer prepakaged goods, juice,water,marmelade,milk. A little somenthing before starting the new day! House Rules L'Arcobaleno Affittacamere takes special requests – add in the next step! Free! One child under 4 years stays free of charge in an extra bed. 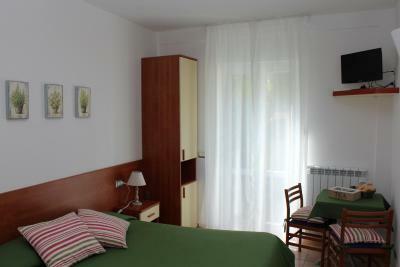 One child from 4 to 10 years is charged EUR 25 per person per night in an extra bed. L&#39;Arcobaleno Affittacamere accepts these cards and reserves the right to temporarily hold an amount prior to arrival. L'Arcobaleno Affittacamere accepts these cards and reserves the right to temporarily hold an amount prior to arrival. A surcharge of EUR 50 applies for arrivals after check-in hours. All requests for late arrival are subject to confirmation by the property. Parking is subject to availability as only 4 parking spaces are provided. Please reserve your parking space in advance to avoid disappointment. Please note you must remove your vehicle after check-out. Please inform L'Arcobaleno Affittacamere of your expected arrival time in advance. You can use the Special Requests box when booking, or contact the property directly using the contact details in your confirmation. Little older property but was clean. Room is quite small - best suited for a couples. Note that most places in Riomaggiorie is quite small - we felt the property gave good value for money though a little small. Standard rooms dont have much view though there is a window. It was a long and very high walk from the train station so unless you have a car or your own personal Sherpa or llama, be ready to shlep your bags up a very high hill! The toiletries in the bathroom could have been nicer, they were basically just like a sample sized pillow packet, the same size as a teabag basically. The hardest thing was the distance from the train station... we certainly got our steps in for our fitbits at this place! Also, it just didn’t have a view at all! I was expecting the opportunity to sit out on a balcony and overlook the ambiance of a Riomaggiore, but it was disappointing for me on this expectation. But still, it’s a quaint cute place.. clean and kind and the longer we were there the more at home we felt ourselves to be. Ali, the beds were really comfortable! It would have been nice to have fresh food for breakfast rather than prepackaged croissants, cake, cheese and bicuits. Yoghurt was provided in the fridge on the second day. Also preferable to have our room replenished with consumables rather than have to ask for them. Being perched at the top of town made for a quiet stay away from the crowds. It was a pretty spot.The outdoor patio was lovely to enjoy a drink and breakfast. The owner was very nice, and the great think of this hotel is that it had parking. The thing is that for the same price, you can find better options in terms of location, and accomodation. The bed was really basic/cheap; towels were bad quality; hot water didnt last long. The hosts were really flexible and friendly. Location was perfect. We had parking and no headaches driving into the town. Could do with more places to pu suitcases out. The steep uphill climb to the B&B from almost anywhere. Not anyone's fault. Great hosts; Francesca and Marco were awesome and so welcoming. Parking on location is very helpful. Breakfast snacks were light but appreciated. Assorted cheap plastic crockery and utensils. Francesca was a great host so lovely, helpful and friendly. Brill location, quiet and cute DIY breakfast you have on your terrace.